LONDON (AP) — The squad has been publicly undermined. There’s been grumbling about the lack of contact from the owner. And the team was just handed its biggest loss in 28 years. Maurizio Sarri’s reign at Chelsea already looks like it’s approaching the end, and he’s not even completed a season. Signing a three-year contract — as Sarri did — means little when you are working for Roman Abramovich and there’s a risk you won’t qualify for the Champions League. Winning the Premier League counted for little when Antonio Conte finished fifth a year later. Even lifting the FA Cup couldn’t save Conte from being replaced by Sarri for this season. Now Chelsea is even worse off, slumping to sixth place after another poor showing on the road. The loss at City wasn’t just a blip but part of a worrying trend for this erratic boost-and-bust club, where success is often the forerunner for an implosion. Three weeks ago, Sarri tried berating his players to the media after a 2-0 loss at Arsenal. They proved him right 11 days later with a 4-0 loss at Bournemouth, a team in the bottom half of the standings. That seems to be a greater embarrassment than Sunday at the Etihad Stadium — a stark reversal after Chelsea ended City’s unbeaten start with a 2-0 win at Stamford Bridge in December. The one place Sarri could find some sympathy on Sunday is from City manager Pep Guardiola. 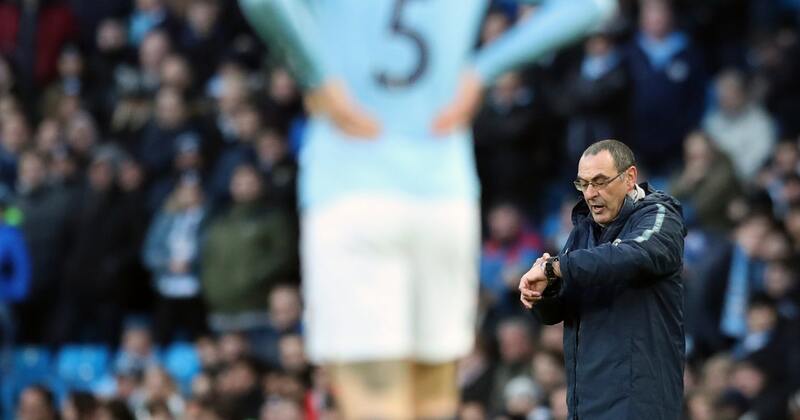 Just as Guardiola’s philosophy was being dismissed as unsuitable for England back then, so now is the much-vaunted Sarri-ball the former Napoli coach has imported to England. Much like Guardiola’s style, Sarri’s tactics rely on free-flowing ball movement fused with constant running and relentless attacking. Not what Abramovich wants to hear. The Russian billionaire, currently denied a British visa, gave the coach the players he needed to adapt the Sarri-ball system to the Premier League, reshaping the team with imports from Napoli. The first arrival was center midfielder Jorginho, one of the key cogs in that Napoli team. Sarri also landed Mateo Kovacic from Real Madrid. But the Italian has never settled on his midfield. Inserting Jorginho into the team has disrupted N’Golo Kante, taking the 2017 player of the year’s defensive midfield shield role. Sarri also can’t decide between Kovacic and Ross Barkley. Sarri has been reunited with striker Gonzalo Higuain, on loan from Juventus, with Alvaro Morata sent to Atletico Madrid last month. With two goals in four games, Higuain has some way to go to prove he is the solution to Chelsea’s long-standing striking struggles. So often Eden Hazard has been deployed as the False Nine. With the winger constantly agitating for a move, and one full season remaining on his current contract, Chelsea has a fight on its hands keeping the team’s one world-class player. In a culture of short-termism youth is rarely given a chance, leaving academy graduates with few opportunities for first-team experience at Chelsea. The signing of Christian Pulisic from Borussia Dortmund for next season has threatened the status of Callum Hudson-Odoi, the 18-year-old forward who had been pushing to leave Chelsea last month. Ruben Loftus-Check, a 23-year-old midfielder, has had to go across London to Crystal Palace on loan to get playing time. When Abramovich looks across London, the Russian will see how Mauricio Pochettino — often out of necessity because of a lack of transfer funds — has promoted youngsters to the first team and excelled. Tottenham is now 10 points ahead of Chelsea in third place despite not making a single signing in the last year. Pochettino and Sarri have something in common: Neither has won a trophy as a manager. Through all the instability, Chelsea has still won 15 trophies since Abramovich bought the club in 2003 while going through almost as many permanent managers. Sarri can end his trophy drought in two weeks in the League Cup final. Just one problem — the opponent is Manchester City.